JESSICA TARLOV is a senior strategist working for Schoen Consulting in New York City. She has experience on a range of projects including advising clients on messaging strategies and on design and execution of polling projects, both domestically and internationally, including Victor Pinchuk, Mayor Michael Bloomberg, CNN and Margaritaville. She is a liberal voice on FOX News and supported Hillary Clinton in the 2016 election. Jessica lived in London for six years after college where she did her Ph.D. on the impact of scandal on politicians’ careers before working for Boris Johnson on his mayoral reelection campaign. 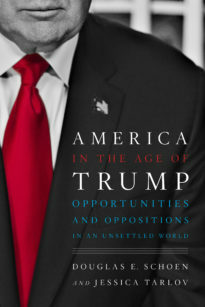 America in the Age of Trump is a bracing, essential look at the failure of a great nation to meet the needs of its people and the challenges of the age—and the resulting collapse of public trust in government, as well as a pervasive crisis of national values, from broken families to a loss of faith in the American idea itself.